Omni-Heat™ Reflective lining, they’ll stay warm, dry, and focused on shredding instead of shivering at the lodge. Includes a powder skirt, helmet-compatible hood, and a ski pass pocket. 3 jackets-in-one. 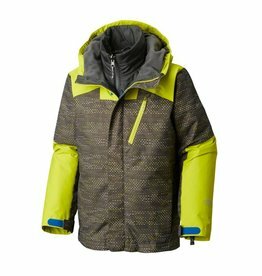 He can wear the waterproof-breathable shell and inner insulated jacket separately or together for maximum warmth and protection with our exclusive Interchange System.